In an attempt to boost the construction sector and restart stalled projects, the Cabinet Committee on Economic Affairs (CCEA) on Wednesday approved the National Institution for Transforming India (Niti) Aayog’s policy note aimed to help debt-laden companies. The government’s think tank had proposed easier rules for fast settlement of disputes in order bring in liquidity and restart stalled real estate and infrastructure projects. “The attempt is to de-stress real estate companies as the measures will pump in liquidity,” said finance minister Arun Jaitley while addressing a press conference in New Delhi. He added that the government will work with the Reserve Bank of India to improve liquidity for projects in the short run. Under the new rule, even when a construction award is under arbitration, 75% of the money will be paid to the concessionaire against margin-free bank guarantee by the contract-awarding body. This will ensure that the project does not stop midway. It has also been proposed that every construction company should have a conciliatory board to help in resolving disputes. 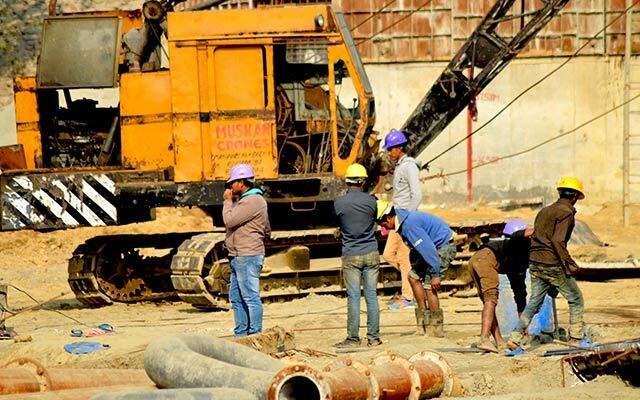 “The note made by the Niti Aayog was to help the construction sector which contributes 8% to the gross domestic product (GDP), attracts second-highest foreign direct investment after the services sector and creates large number of jobs,” Niti Aayog chief executive officer Amitabh Kant told CNBC TV18. The Reserve Bank of India on Monday said that the Indian economy is likely to expand at 7.6% in 2016-17. Bharatiya Janata Party-led government is projecting a GDP growth of 7-7.75% for the current financial year. Kanth added that the objective is to make the sector a key driver of growth and get stalled projects going. One of the most important electoral planks of the National Democratic Alliance government which came to power in May 2014 was job creation. With initiatives such as Make in India and Skill India aimed at creating employment opportunities, sectors such as construction and manufacturing will have to play an important role. Jaitley said that in the future, the country will require more housing as urbanisation goes up and the construction sector has the potential to generate employment. Niti Aayog was set up on 1 January 2015 replacing the Planning Commission. It comprises of the Prime Minister as the chairperson. Its governing council comprises of the chief ministers of all the states and the lieutenant governors of the Union territories.